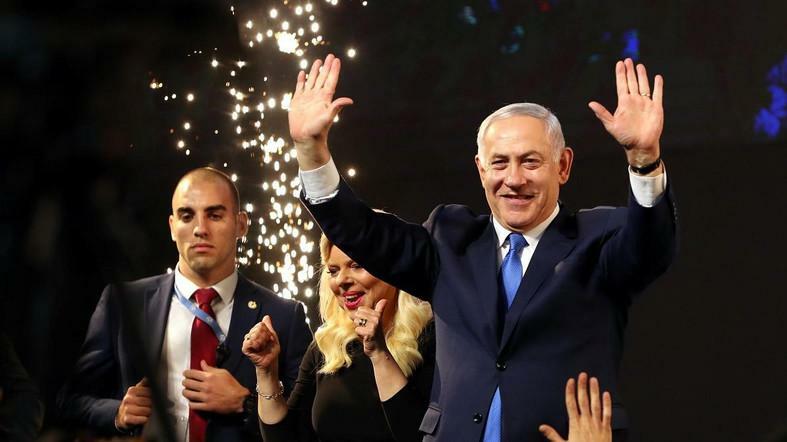 Israeli Prime Minister Benjamin Netanyahu secured a clear path to re-election yesterday, with religious-rightist parties set to hand him a parliamentary majority despite a close contest against his main centrist challenger, a vote tally showed. With more than 97 percent of votes counted as at press time, Netanyahu’s conservative Likud party looked likely to muster enough support to control 65 of the Knesset’s 120 seats and be named to head the next coalition government. It would be his record fifth term as premier. “It is a night of colossal victory,” the 69-year-old Netanyahu told cheering supporters in a late-night speech at Likud headquarters in Tel Aviv after Tuesday’s vote. “He’s a magician!” the crowd chanted as fireworks flared and Netanyahu kissed his wife Sara. President Reuven Rivlin said on Twitter he would begin meeting next week with political parties that won parliamentary seats to hear who they support for prime minister. At the sessions, which Rivlin said would be broadcast live “to ensure transparency”, he will then pick a party leader to try to form a coalition, giving the candidate 28 days to do so, with a two-week extension if needed. His challenger, the new Blue and White party of ex-army chief Benny Gantz, claimed a more modest victory after winning a 35-seat tie with Likud. Unless he reverses on campaign pledges to shun Netanyahu, and joins him in a broad coalition, Gantz looked destined to lead a center-left parliamentary opposition.